Chase is currently offering $200 bonus cash back when you spend $500 on purchases in the first 3 months of opening your AARP Credit Card. That’s up from the $100 that is typically offered. The card earns 3% cash back at restaurants and gas stations and 1% cash back on all other purchases with no annual fee. It also offers a 0% intro APR for 12 months on purchases and balance transfers (3% balance transfer fee, min $5). Cash back rewards are tracked as points in this program, where each penny in cash back rewards earned is equal to 1 point. 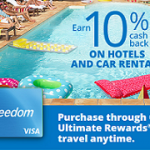 Points can be redeemed for cash back or any of the other redemption opportunities provided through Chase. A minimum of 2,000 points is needed to redeem for cash back. There are no earning caps and rewards do not expire as long as your account remains open and in good standing. Note that you do not need to be an AARP member in order to be eligible for this card. Simply leave that space blank on your application if you are not an AARP member. Overall, this is a solid cash back card if you don’t already have a good cash back card for gas or restaurant purchases. A plus is that it comes with a reasonable bonus with a low minimum spend requirement. Note: If you currently have an AARP credit card or have received a new cardmember bonus for the AARP credit card within the past 24 months, you are not eligible for this offer.